Thirsty Pilgrim: Loophole Shrinks on Belgian Smoking Ban. Loophole Shrinks on Belgian Smoking Ban. On January 1 the smoking ban in Belgium went from being a bit of a joke to something reasonably effective — as far as I can tell. The loophole has shrunk substantially, and many cafés face a tough choice: smoking or food. This appears to be the pertinent law here (in French). As I read it, pubs can allow smoking if the only food they serve is pre-packaged and keeps for at least three months. Before, the only places where smoking was banned were proper restaurants of the kind that are open only for meal times, shutting during the afternoon for example. Brasserie-type cafés, where a lot of people eat anyway, could be smoky and stay open all day long. In theory only 30% of sales could be from food is smoking was allowed, but judging by a few places I don't know if that was ever really enforced. The local news has reported that smoking bars can only serve "chips and nuts." That's true in spirit but not quite accurate. I can think of other foods with longer keeping periods that could conceivably be "pre-packaged." Dried sausages. Aged cheeses. TV dinners. Spaghetti-O's. Use your imagination — because the bars will, if that means keeping smokers but giving folks a chance to eat something decent. Stay tuned... I intend to talk more with some local proprietors about it. For now, the law appears to be good news for those of us who like to smell and taste our food and drink. 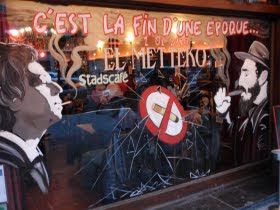 The photo shows a clever window display at El Metteko, a café on Boulevard Anspach near the Bourse in Brussels. It says, "This is the end of an era." 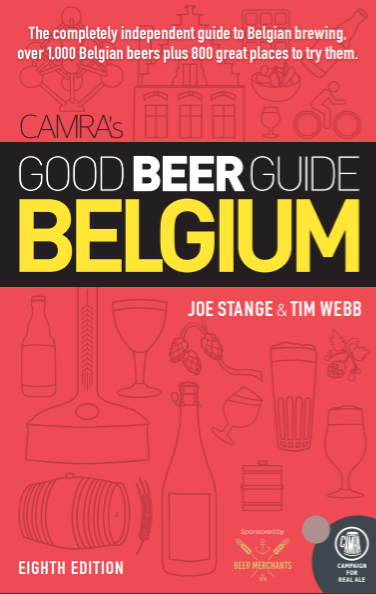 Beery Guidebooks are the Best Kind. How to Get Some Armand'Spirit. Dupont to Release Special Dry-Hopped Saison. A Liter of Stille Nacht. Sharing Recommended.